You can always tell when fall has arrived as everywhere you turn there are pumpkin and pumpkin spiced recipes. I have done my fair share of pumpkinny baking and creating recently. I gave my Pumpkin Pie with Caramel Sauce a revamp a few weekends ago, replacing the old and rather unappealing pictures with lovely new ones, and I published my Chocolate Tahini Pumpkin Smoothie. Have you tried that one yet? It’s a seriously good way to start the day! 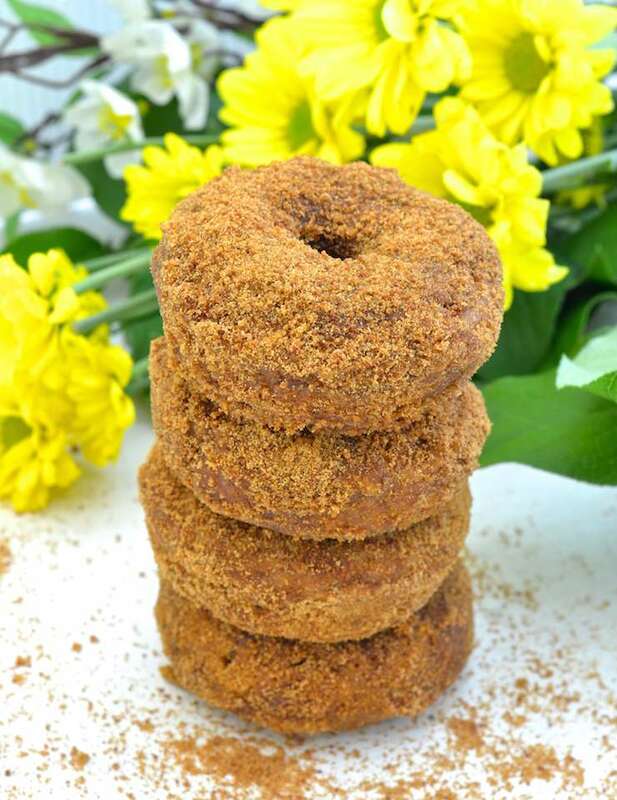 I also dusted off my neglected donut pan and put it to good use again by baking these Pumpkin Orange Donuts. Is pumpkin orange a flavour combination you have tried before? I hadn’t until now, but the two work absolutely perfectly together. Just the zest is used and the flavour cuts through the pumpkin and the sugar, adding a refreshing citrus burst. It’s a truly irresistible combo! These donuts come together really quickly and easily. All you have to do it put the dry ingredients in one bowl, the wet in another, then combine. Just like making muffins. They bake up really quickly too and are fantastic eaten fresh from the oven! 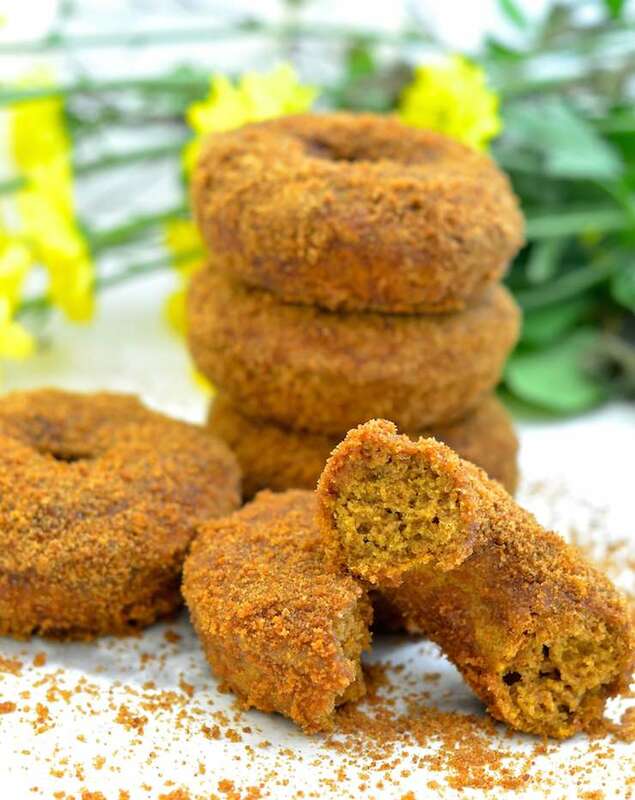 The recipe for these Pumpkin Orange Donuts is oil-free but to get the sugar to coat really well I found the most effective way is to brush them with a little melted coconut oil. You could easily skip this step if you really need to keep them completely oil-free. They will still taste amazing, the sugar just won’t stick quite as well. I hope you enjoy these delicious, sugary Pumpkin Orange Donuts. Let me know what you think in the comments below or share a pic on Instagram and tag me @avirtualvegan. Use the #avirtualvegan to be sure I won’t miss them. Add the cashew nut butter and the pumpkin to a small bowl or jug and stir until well combined. Pour the liquid into the dry ingredients and stir to combine. Don't over stir. Just enough that everything is combined and you can't see any dry four. Bake for 13 - 15 minutes or until a tooth pick comes out clean. Leave to cool just long enough that you can handle the pan and donuts without burning yourself, then turn them out onto a cooling rack. Pumpkin spice isn't something that is readily available in Europe. It is a mix of a few different spices and you can easily make your own. Here is a great quick recipe. If you do not have a donut pan you can use a mini muffin pan to make donut holes instead. You can also bake asfull size muffins . Just be sure to adjust the cooking time to suit the different volume of batter. 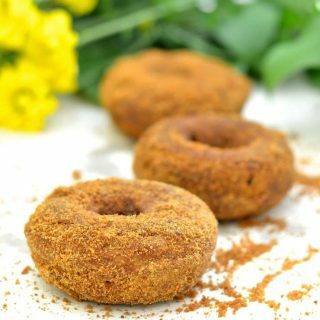 If you would prefer to not use the coconut oil to make the sugar stick, roll the donuts in sugar while they are hot. Just leave them to cool until they are comfortable to handle first. If you want a lot of sugar to stick then lightly brush the donuts with coconut oil before rolling in the sugar. It is best to do this as you want to eat them as they tend to go a bit damp if stored once coated. Store the donuts in an airtight container. They are best eaten the same day but are ok the day after too. These donuts freeze very well as long as you don't coat them in sugar first. I have never had pumpkin and orange together before, but I bet it is fantastic! I love orange in baked goods so much, so I know I’d love these. I love all of the ingredients too. I love using cashew butter in my desserts and always have a ton on hand, haha! And yes, to lots of sugar on the donuts, yum! These look so good! I love the crumbly topping. I’d have a hard time eating just one! Thank you. I have that problem with anything remotely donut/cake like! These look so delicious! What an amazing combo! I’ve never thought of pairing pumpkin and oranges! Thank you Sina. It’s such a great combo! These are making me drool. I’m going to make some doughnuts! 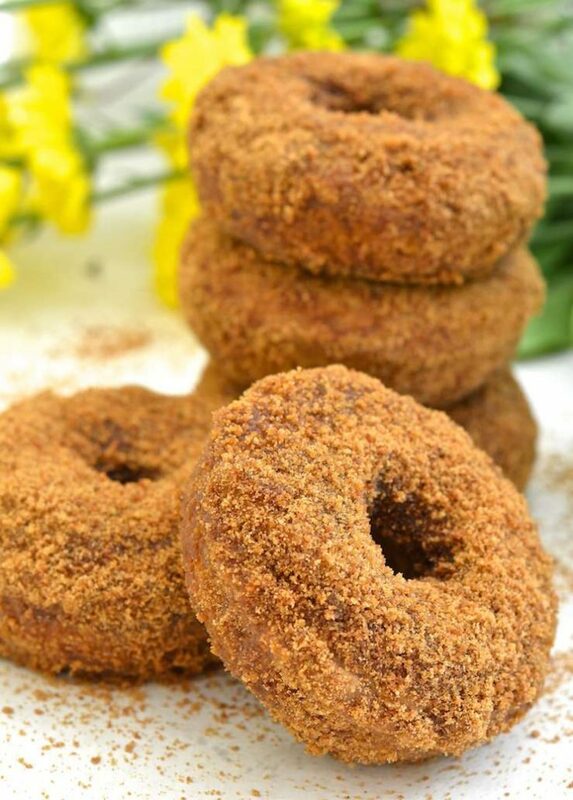 You just can’t beat homemade doughnuts! Great flavour combo! And who knew doughnuts could look so pretty??? Thank you and yes you need a donut pan! If you can pick up a Wilton one they are really cheap. Like about $6. I have one and it’s great. They never stick. These donuts look heavenly! I seriously can’t believe they are vegan. Look amazing! I love that you used cashew butter in this. And that coconut sugar coating – yum! These look so tasty! I love that you’ve included instructions on making donut holes if you don’t have a donut pan. Thank you Dianne. I wanted to cover all bases! These look amazing, Mel! I love pumpkin and orange together. And everything really does taste better in donut form. Oh, and I have found the easiest way to get sugar to stick to donuts without using oil or butter is to dunk them in the sugar when they are still quite hot! The moisture from the heat will get them to stick! These look so awesome! I love pumpkin and orange together. Thank you Becky. It sure is a great combo!